This research provides an empirical test of the “Twitter effect,” which postulates that microblogging word of mouth (MWOM) shared through Twitter and similar services affects early product adoption behaviors by immediately disseminating consumers’ post-purchase quality evaluations. This is a potentially crucial factor for the success of experiential media products and other products whose distribution strategy relies on a hyped release. Studying the four million MWOM messages sent via Twitter concerning 105 movies on their respective opening weekends, the authors find support for the Twitter effect and report evidence of a negativity bias. 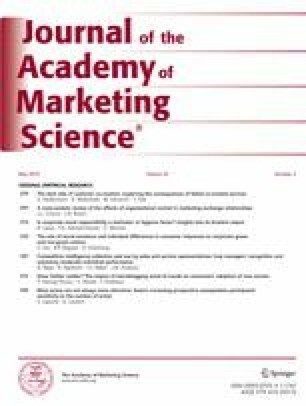 In a follow-up incident study of 600 Twitter users who decided not to see a movie based on negative MWOM, the authors shed additional light on the Twitter effect by investigating how consumers use MWOM information in their decision-making processes and describing MWOM’s defining characteristics. They use these insights to position MWOM in the word-of-mouth landscape, to identify future word-of-mouth research opportunities based on this conceptual positioning, and to develop managerial implications. The authors thank three anonymous JAMS reviewers, Andre Marchand and the participants of research seminars at Cass Business School, the University of Muenster, the University of Hamburg, the Technical University of Munich, HEC Paris, ESCP Paris, the Vrije Universiteit Amsterdam and the UCLA/Mallen Workshop in Motion Picture Industry Studies for their constructive criticism on previous versions of this article. They also thank Benno Stein and Peter Prettenhofer for their help with the WEKA analysis, Mo Musse and Peter Richards for their IT help, Chad Etzel from Twitter for supporting the data collection, and Arzzita Nash for help with the coding. Finally, the authors are grateful for research funds provided by Cass Business School and City University London that supported this project. Ahmad, I. (2013). 30+ of the most amazing Twitter statistics. Retrieved December 16, 2013, http://socialmediatoday.com/irfan-ahmad/1854311/twitter-statistics-IPO-infographic. Anamika S. (2009). Microblogging sites–40 Twitter like websites list. Retrieved January 19, 2012 http://anamikas.hubpages.com/hub/40-Microblogging-Sites-list-for-Communication-Twitter-Alternatives. beevolve (2012). An exhaustive study of Twitter users across the world. Retrieved January 17, 2014, http://www.beevolve.com/twitter-statistics/. Bennett, S. (2013). Who uses Twitter? 16% of internet users, 18-29 year olds, minorities, men more than women [REPORT]. Retrieved January 17, 2014, http://www.mediabistro.com/alltwitter/twitter-demographics-2013_b36254. Corliss, R. (2009). ‘Bruno’: Did Twitter reviews hurt movie at box office? Retrieved August 17, 2010 from http://www.time.com/time/arts/article/0,8599,1910059,00.html. Kassim, S. (2012). Twitter revolution: how the Arab Spring was helped by social media. Retrieved January 11, 2012 from http://www.policymic.com/articles/10642/twitter-revolution-how-the-arab-spring-was-helped-by-social-media. Lang, B. (2010). Study: the ‘Twitter effect’ does not exist. Retrieved on October 12, 2011 from http://www.thewrap.com/media/column-post/thegrill-twitter-effect-myth-21035?page=0,0. Max Planck Institute (2011). The Twitter project page at MPI-SWS. Retrieved on December 23, 2011 from http://twitter.mpi-sws.org/. McGee, M. (2012). Twitter: 60% of users access via mobile. Retrieved on January 22, 2013 from http://marketingland.com/twitter-60-percent-of-users-access-via-mobile-13626. Mills, S. (2012). How Twitter is winning the 2012 US election. Retrieved on January 11, 2012 from http://www.guardian.co.uk/commentisfree/2012/oct/16/twitter-winning-2012-us-election/. MPAA (2012). Theatrical market statistics 2012. Retrieved on January 17, 2014, from http://www.mpaa.org/resources/3037b7a4-58a2-4109-8012-58fca3abdf1b.pdf. Nakashima, R. (2012). ‘John Carter’: Movie to lose $200 million, among biggest Hollywood flops ever. Retrieved on January 15, 2013 from http://www.csmonitor.com/The-Culture/Latest-News-Wires/2012/0320/John-Carter-Movie-to-lose-200-million-among-biggest-Hollywood-flops-ever. Pang, B., Lee, L., & Vaithyanathan, S. (2002). Thumbs up? Sentiment classification using machine learning techniques. Proceedings of EMNLP. Retrieved on August 10, 2010 from http://www.cs.cornell.edu/home/llee/papers/sentiment.pdf. Parker, L. (2012). The digital revolution: how consumers are driving the future of games retail. Retrieved on January 7, 2012 from http://www.gamespot.com/features/the-digital-revolution-how-consumers-are-driving-the-future-of-games-retail-6396713/. Pomerantz, D. (2009). Movie critics vs. the audience. Forbes Online. Retrieved January 21, 2014 at http://www.forbes.com/2009/08/27/movies-twitter-matt-atchity-business-entertainment-tomatoes.html. Singh, A. (2009a). Inglourious Basterds a box office hit ’thanks to the Twitter effect’, The Telegraph. Retrieved December 16, 2013, at http://www.telegraph.co.uk/news/celebritynews/6081711/Inglourious-Basterds-a-box-office-hit-thanks-to-the-Twitter-effect.html. Singh, T. (2009b). How Hollywood embraced social media. Retrieved on December 28, 2011 from http://www.ngonlinenews.com/article/hollywood-and-social-media. Smith, C. (2013). (December 2013) By the numbers: 68 amazing Twitter stats. Retrieved on January 17, 2014 from http://expandedramblings.com/index.php/march-2013-by-the-numbers-a-few-amazing-twitter-stats/#.UtlsfxCwbYg.